Yesterday night I went to Target with my hubby-bubby to get a co-axial cable for a DVD player. Then he got interested in the cameras, and needless to say, I was not interested. So I meandered across to the children’s princess aisle. Along with all the great princess stuff, I found Fancy Nancy items! You don’t know who Fancy Nancy is? You should – she’s pretty awesome. Anyhow, at Target they had Nancy’s crown, her ballet slippers, an awesome hat, her tutu, purses, her sunglasses, a dress, and a Fancy Nancy doll! I wanted to buy every single thing I was so smitten! 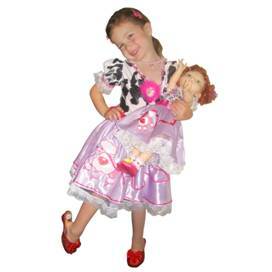 I seriously want to name one of my daughters Nancy now so that I can dress her up like Fancy Nancy! So cute!